Home › French Wine › Champagne: Raising a glass to the World’s Favorite Bubbly. What better way to celebrate the news that I had been selected to participate in a wine and culinary tourism press trip to the Champagne region of France, than with a glass of bubbly. Well several glasses of bubbly since this was a Champagne paired dinner. Champagne, the world’s ultimate celebratory tipple, the “prima donna” of wine with so much mystique and glamour surrounding it, an iconic beverage filled with flavor, essence and history. This playfully teasing sparkling wine has so many famous quotes associated with it, including one by Napoleon Bonaparte, who said, “In victory one deserves it, in defeat one needs it”, and another one by the late Lily Bollinger, “I drink it when I’m happy and when I’m alone. When I have company I consider it obligatory. I trifle with it if I’m not hungry and I drink it when I am. Otherwise I never touch it, unless I’m thirty”. To quote from The World Atlas of Wine by Hugh Johnson & Jancis Robinson, “To be Champagne, a wine must do more than sparkle. It must come from the Champagne region of France”. Yes this is true. Champagne is a sparkling wine produced exclusively in the Champagne region of France made in accordance with C.I.V.C (Comité Interprofessionnel du vin de Champagne). Outside of this region the French sparkling wines are referred to as Crémant or Mousseux. So not every sparkling wine, even from France, can be called Champagne, a common mistake made by a lot of people. An invitation from Zanotta, the Italian restaurant at The Leela Ambience Gurgaon, for a Champagne paired dinner, took me a little by surprise. What! Only Champagne! In our consciousness Champagne is ingrained mostly as an aperitif and the concept of pairing an entire meal with just champagne seems a little alien, albeit interesting. It made me sit up and recall all that I knew about this delicate, racy, lusty bubbly, the world’s most lively drink with those millions of inexhaustible bubbles dancing in the glass. Ever wondered what words like NV, Cuvée, Vintage, and Blanc de Blancs etc written on the label of a Champagne bottle stand for. Let me first decipher the label a little before I talk about the dinner. Cuvée means a blend (of dry base wines) which most Champagne is. It is in the making of the cuvée that the difference between different brands of Champagne lies. N.V (Non-Vintage) Champagne is a blend of several vintages from different harvests, styled to taste the same year after year. So basically it contains wines from more than one year. Surprisingly, the reputation of an established house is based on its non-vintage wines. A Vintage Champagne is a wine from a single superior year and comes with a higher price tag. “Prestige Cuvée” is the very best wine made only from the finest grapes produced by a house, the finest champagne made by a vintner and examples of this are Dom Pérignon from Moët & Chandon, Cristal from Louis Roederer, Taittinger Comtes de Champagne. Champagne has a classic recipe. It is a combination of three grape varietals, Chardonnay, Pinot Noir and Pinot Meunier. However if a label says Blanc de Blancs “White from White”, this means that the Champagne is made from 100% Chardonnay. Blanc de Noir “White from Black”, on the other hand, is made from Pinot Noir or Pinot Meunier. So how come red grapes like Pinot Noir and Pinot Meunier yield a white base wine. It is the very gentle pressing which ensures the absence of skin contact and makes it possible. The terms Brut, Extra Brut basically indicates the sweetness level, with Brut meaning dry. The term Réserve written on Champagne is meaningless. Coming to the bubbles in a glass of Champagne. Yes, size does matter, but in this case smaller the bubbles, better the quality of the sparkler. So why do we treat Champagne only as a celebratory drink to be imbibed only on special occasions or invariably as an aperitif before dinner. Why can’t we treat it like a regular wine and pair it with all sorts of food. It doesn’t always have to be a red wine with the main course. 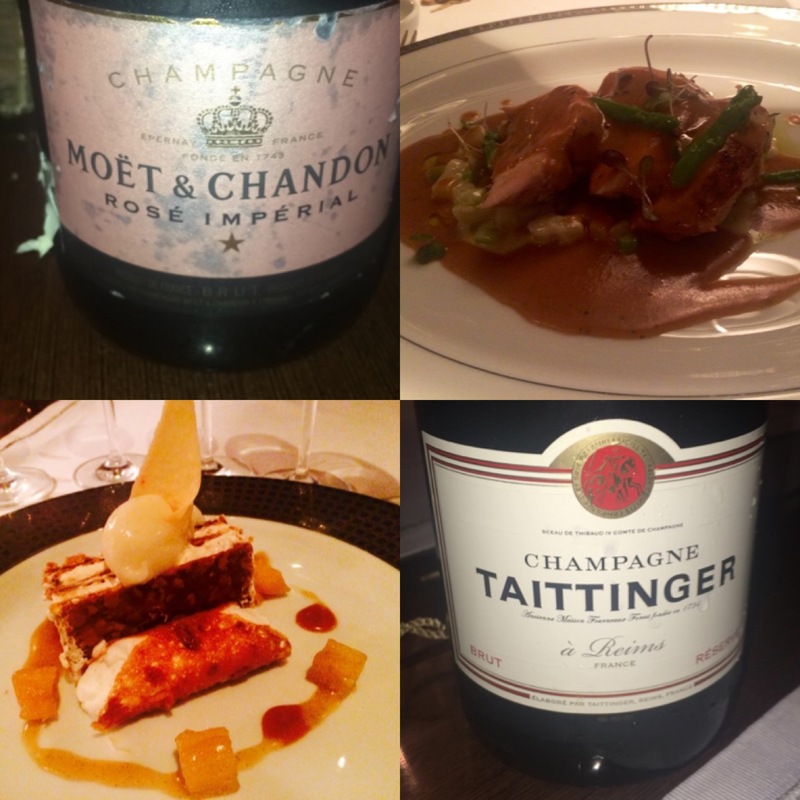 The Champagne paired dinner at Zanotta, Leela Gurgaon; titled Bubbles….Bubbles….Bubbles showcased the remarkable versatility of this “niche wine” as a food wine. One knows that a hotel takes its wines seriously when the General Manager himself, in this case Michel Koopman, sits with the chef, Christian Caberera, and the restaurant manager Sankhadeep Sengupta who is a sommelier and plans the menu, tasting and approving each dish and deciding on the pairings as there are so many different styles of Champagne to choose from. 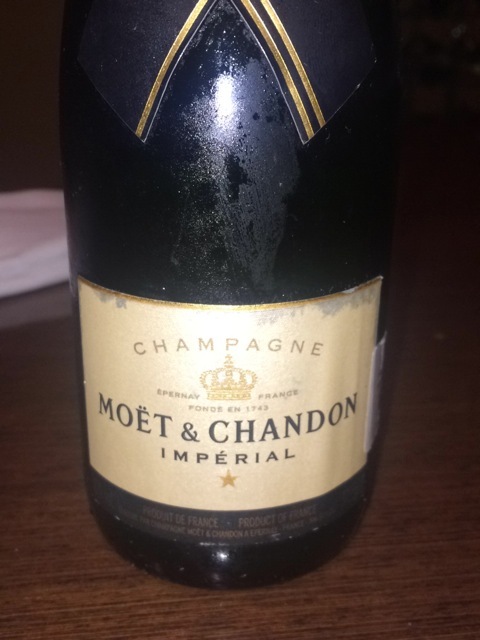 The dinner began with the Moët & Chandon Brut Imperial served with the canapés. A great start as this is an out and out party wine with its lovely apple and pear finish with a burst of lemon, its fabulous acidity jumpstarting the appetite. The stand out among the canapés were these little balls of choux dough mixed with black truffle slightly drizzled with cheese honey. The first course at the sit down dinner was a Terrine of Foie Gras with micro green salad, pistachio dressing and chives sour cream. 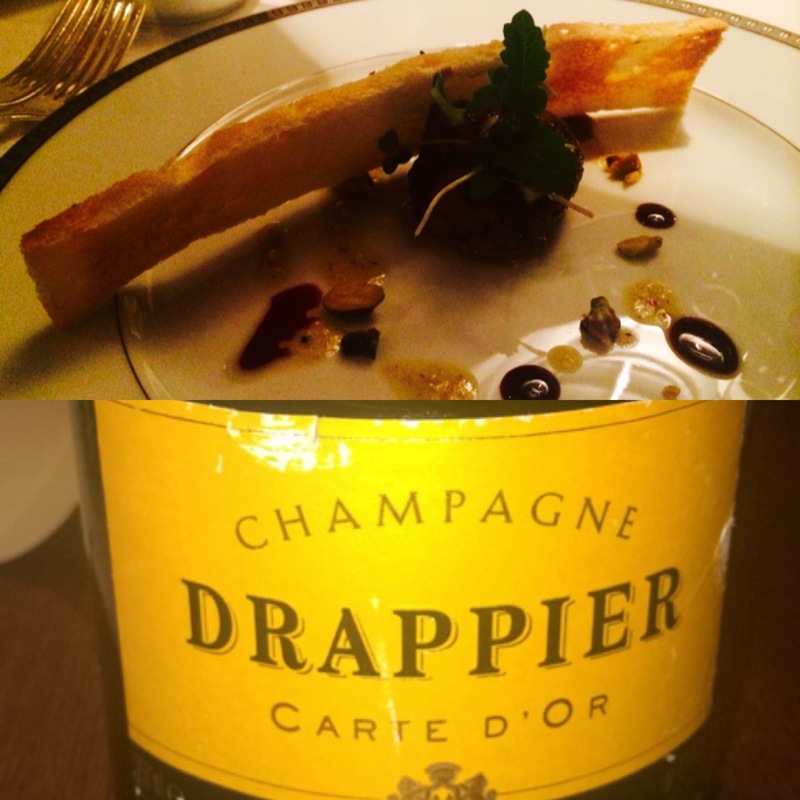 This was paired very well with the Drappier, Carte d’Or Brut, a Pinot Noir dominated champagne with the richness of stone fruit and a slightly complex palate. Its rich quince flavour matched the sumptuousness of the foie gras. 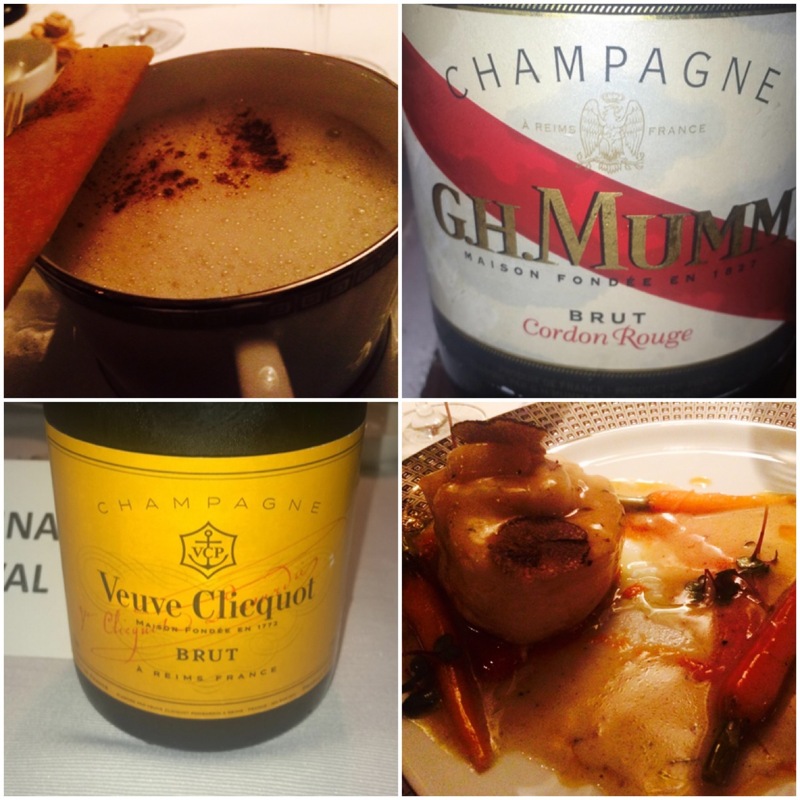 Champagne and soup, if you thought this is an unconventional pairing, then think again. The Velouté de champignons blancs boulettes de truffle, Mushroom soup with white truffle dumplings, caramelized nuts and Parmesan foam which I had at the Champagne dinner was brilliant. It was paired with G.H Mumm Brut, Cordon Rouge and the umami flavour of the mushrooms got lifted beautifully with the Mumm, showcasing the brilliance of the talented chef in creating this heavenly soup. The next course of Champagne poached sea bass with truffle emulsion, glazed carrots and creamy carrot puree was paired with the Veuve Cliquot, Brut in which the honeyed smoky finish of VCP managed to lift the dish, showing how a pairing can create a better taste and balanced flavour, than two ingredients on their own. It is always very interesting when one has a sommelier explaining the pairing and narrating interesting little anecdotes about the wines during the course of the event. For the Champagne dinner we had Gagan Sharma, a wine educator and sommelier, whose witty commentary added to the fun we had with so much bubbly being imbibed. In his words while describing the next course which was paired with the Moët & Chandon Rosé Imperial and Veuve Cliquot Rosé “Two Roses posed as the potential bride to the sundried tomato and ricotta filled Grilled Organic Chicken dish, but none could charm it enough to be married in harmony. Thankfully some VCP Blanc Brut was still sitting in the arsenal to rescue the day”. I agree with him on this. The chicken dish which was very well made, paired better with the Brut than the Rosé. The best was saved for last. My favorite Champagne of the day, Taittinger, Brut Reserve, a delicately balanced champagne with aromas of fruit and brioche, served with Poire Napoléon, a caramelized puff pastry with diplomatic cream, vanilla chantilly and three pear textures. This was one of those evenings where the food and wine was in perfect harmony and the company delightful. I remembered that famous quote by the prominent economist John Maynard Keynes who said “My only regret in life is that I did not drink enough Champagne”. I hope I have no such regrets. Thank you Mireille. Looking forward to meeting you at Reims and thanks for all your help.